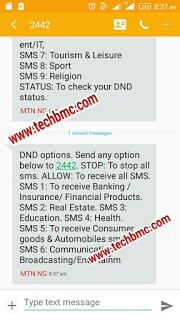 MTN Network, finally introduced a code, in which every of their customer can use to opt out of all the Unsolicited SMS messages that always pop in your mobile phone without your own consent. At list one can now rest from all these disturbing SMS. I think this was released because of what Nigeria Communication Commission (NCC) said to all Networks operating in Nigeria in the past Month May 2016. In case you don't know about this, NCC made an order to all telecommunication industries in the country being Nigeria, to stop disturbing their users with useless SMS and irrelevant adverts because, all these are being sent to someone's line without the consent of that user. And if any of these networks which include MTN, Etisalat, Airtel, Glo, and Ntel refuses to comply, will be fined and believe you me, no network would want such to happen to them. So MTN experiencing what they passed through in the previous fine by NCC, wouldn't want such to take place again. Now, they are really doing their best in compliance with NCC order, same is expected from other networks. Who doesn't know how painful it is, when you must have tried many apps you lay your hands on in other to stop these unsolicited messages, but all could not avail. Sometimes, you charge your phone battery for important things to do with it, but still, you are bombarded with irrelevant advert that doesn't concern or relate to what you need, thereby draining the battery you charged for an important purpose. The worst is, when you seem to comply to some of these advert SMS, they make away with your recharged airtime whenever you recharge your line. Oh! I really know how you feel about that. Say bye bye to all that and thanks to MTN for complying with NCC in releasing how to put an end to all that trash. the message is free and will not charge a dime from you. So, once the reply, you’ll get to see options for opting out from any of the particular sms campaign ranging from health, sports, educational, banking and many more etc.. STATUS: To check your DND status. DND options. Send any of the option provided below to this number 2442. ==>STOP: This is to stop all sms. ==>ALLOW: Enables you to receive all SMS. >>SMS 1: To receive Banking / Insurance/ Financial Products. >>SMS 5: To receive Consumer goods & Automobiles sms. ✔ MTN Ready To Roll Out 4G LTE Network In Abuja And Lagos. Now, as seen above, to opt out from any of the adverts or services, just make sure ti reply with the corresponding number from the given lists above. NCC has done well too for the stipulated order. Now that you have this update, don't enjoy alone, always share. Thanks.